A Minneapolis nonprofit planted grasses and shrubs in the Hennepin-Lyndale corridor this year, aiding a longtime effort by residents to make the area more welcoming to pedestrians and visitors. Green Minneapolis partnered with several neighborhood groups, the city and the Minnesota Department of Transportation to install plants at four sites along Hennepin and Lyndale avenues near the Walker Art Center. The plantings came about a year after the city finished road construction in the corridor, a project that included adding crosswalks, improving light timing and eliminating a northbound lane of traffic along Hennepin Avenue. Green Minneapolis is a non-profit conservancy focused on enhancing the vitality of downtown Minneapolis through greening, according to Shogren. The organization operates and maintains The Commons park in Downtown East and serves as the fiduciary on behalf of Minneapolis for the Peavey Plaza project. 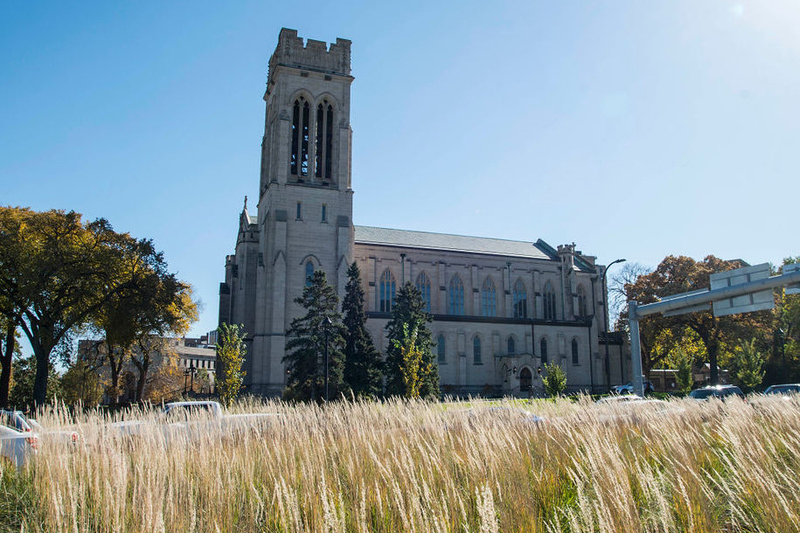 The conservancy noted in a press release that the Hennepin-Lyndale corridor holds some of the region’s most important institutions and civic spaces, such as the Walker Art Center, the Minneapolis Sculpture Garden, Loring Park and the Basilica of St. Mary. It said that the corridor to date has been traffic-focused and uncomfortable for pedestrians. MnDOT provided funding for the plants, according to the release. Area institutions and building owners have committed to providing annual contributions for maintenance work, said John Van Heel, the project leader for Citizens for a Loring Park Community. The effort comes about 10 years after residents in Lowry Hill and Loring Park began advocating for corridor improvements, according to Craig Wilson, a former Lowry Hill Neighborhood Association president. The Great Recession cut short MnDOT’s vision for major changes to the corridor, he said, but residents pressed the city to include improvements after it received a grant to resurface the area. “It was ultimately a matter of establishing trust with Public Works and letting them know that we should be seen as a resource,” Wilson said. Green Minneapolis has 10 other areas in the corridor where it hopes to plant trees and grasses. Shogren said she’d love for the organization to replicate such work all across downtown.